My washer and dryer went out with a bang yesterday. LITERALLY. The washer had just begun a spin cycle when suddenly there was a loud explosive sound inside the machine, followed by a strong smell of burning electronics. Luckily the circuit breaker flipped immediately and the electrical current was cut off, but the circuits in the electronic panel had already scorched and melted. 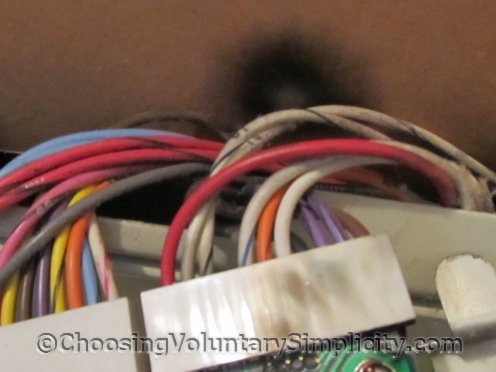 There is more visible burn damage in the motor relay near the washer drum and much of the interior wiring burned. The washer and dryer were a stacked unit and shared the same electronics, and the electronics are a mess. Repairing them isn’t feasible because we bought this Maytag set twenty-nine years ago, and most of the parts are no longer available. It’s amazing, really, that the washer and dryer lasted all these years… but it also feels odd… I guess because despite their advanced age, up until the explosion both machines were still “working.” We had decided not to replace them until we absolutely had to. And now we absolutely have to. Change happens really fast sometimes. Shirley, you always amaze me – I would be climbing the walls if I suddenly had to buy both a new washer and a new dryer. I hope you find just what you want and a great price. I have never commented before but I really enjoy your blog and spend more time than I should here. We had an explosion like that once in the oven of an electric stove. The noise was so loud we all came running to see the coils in the oven burning furiously. Like yours the circuit breaker had already turned off the power but it was an experience I don’t care to repeat. I never knew that electrical things could explode like that. It sure was scarey. I just found your blog and I *love* it! There is so much here that I could spend days just reading through your posts. I wanted to say thank you for all that you do. This is terrific! I agree Tricia it can be scary, a few years ago I decided to stay up late to finish the film i was watching even though I had an early start. About twenty minutes later my big old square computer monitor that was on stand-by in the living room too, started clicking and flashing with smoke coming out of the back. I got to the switch before the breaker tripped. I never forget that I would have been in bed if it hadn’t been for that film(I have no idea what it was) it does bare thinking about.